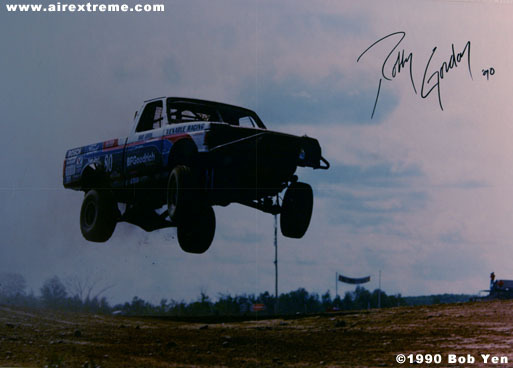 autographed poster (20x30 or 30x40) of "Robby Gordon over Crandon '90"
autographed poster (20x30 or 30x40) of "Jack Johnson over Primm '92"
I am considering the sale of LIMITED-EDITION prints (20x30 or 30x40 posters), of the above photos. (or possibly *autographed*, which entails negotiation of sales residuals with the racer-in-question). A LIMITED-EDITION market-approach uses the concept of EXCLUSIVITY, to set a premium price-point (i.e., they're EXPENSIVE because of their notoriety/rarity, but can be considered an investment for resale at a later date). I'm considering a price-point of $500 - $1000. 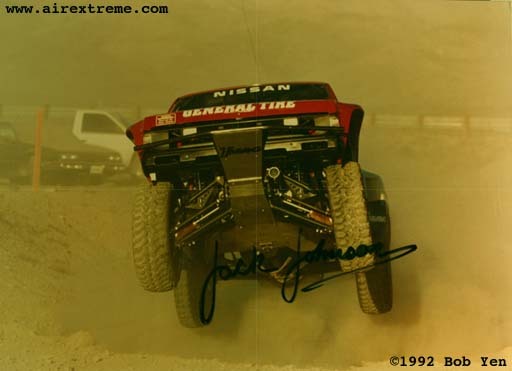 I'm not in the business of selling mass-market photos, I'm more interested in promotion of the Sport of OffRoad Racing (primarily SCORE & BITD events). I feel that by participating in the Marketing Arm of the Sport (Media-Exposure & Public-Awareness), that I'm making a more meaningful contribution. I once sold individual 8x10s & 11x14s to individual racers, but that simply didn't pay the bills. It didn't fully compensate my extensive time/energy in pre-running the race-course for excellent spots & my equipment costs. On that note, please email me your preferences, in terms of LIMITED-EDITION photos & a price-point that's comfortable for you.